The awesome Sidewinder war machine! The best scenario paintball guns are not just realistic looking, but reliable too. The BT Sidewinder paintball gun is an awesome looking M4 combat rifle that's built on the reliable BT4 paintball marker; this gun will never let you down! The BT4 makes a great base for any tactical paintball gun; super sturdy, consistent and highly upgradeable. This gun is plenty accurate and powerful with no modifications, however there are tons of accessories available to upgrade with! 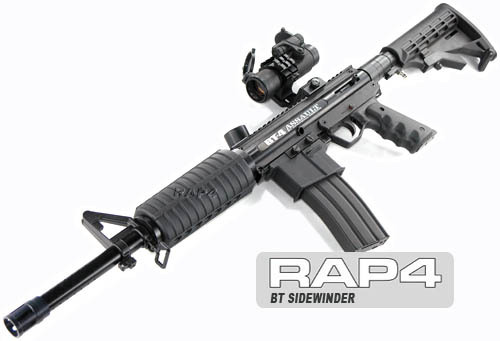 The BT4 Sidewinder Marker features a realistic M4 handguard and mock magazine. The adjustable carbine stock gives this gun a complete look and helps stabilize for better aiming and more accurate shooting. You will love the precision this gun will give you on the field! Besides being built on a terrific base marker, the BT Sidewinder tactical marker also features the accurate 1x30 Reflex Red Dot scope, conveniently offset to the side with the amazing, adjustable Sidewinder scope mount. The options this gun will give you on the field will make you love it for a long time! Buy the BT Sidewinder Paintball gun from Choicepaintballguns for a super low price. The superior quality of this marker makes this sale a real bargain.